Yep, we're back to the big-eyed art for a revisit! Mostly? Because I came across this wonderful artist on Etsy that I just have to share with you. She combines two of my favorite things, you see. Bright, beautiful colors and that big, wide-eyed artwork design that you first saw come about decades ago depicting kittens and little kids and was just recently brought back into style via Shrek's absolutely adorable Puss-n-Boots character. The Dreamy Giraffe Collection by Kathy R Jeffords is my fascination for today. It's a shop on Etsy that's filled with beautiful prints and original art that celebrates color just as much as I do! Kathy Jeffords is a wonderful artist who loves to both draw as well as write, and many of her pieces have stories that go along with them. Her work is beautiful and enchanting, and so is her story! 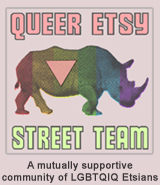 So be sure when you stop by her shop to check out her profile as well as her artwork. Also, she has a sale going on right now that's very innovative too! She started out by dropping all of her prints to $10 and she's now gradually raising them $1 a week until they're back up to their regular price of $18. So the sooner you check her out, the better deal you'll get! YOU CAN CLICK ON THE PICTURE ABOVE TO VISIT THE KATHY JEFFORDS' THEDREAMYGIRAFFE SHOP AND TAKE A LOOK AROUND OR, IF YOU PREFER, CLICK RIGHT HERE. I LOVE the dreamy giraffe and have a few of her prints hanging in my craft room. i will have to check out her sale! I love that style of art. 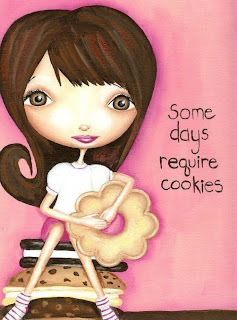 It is dreamy and beautiful and some days do require cookies...lot of cookies. what a great promotion--very good idea! & cute to boot!